In last week’s newsletter, I mentioned that I wanted to write about the difference between belonging and fitting in. I want to touch on that a bit more because I think it has a big impact on middle school students in particular as they navigate their social settings but also on the world as a whole. I found this video of Brene Brown (author/researcher and storyteller) on CBS very interesting. It’s geared more towards the world in general than on adolescents but It certainly applies. It’s interesting to think about this in the greater context of the world today but also to zoom in on our students who are affected in much the same way. Her famous quote, “True belonging doesn’t require you to change who you are, it requires you to be who you are”, resonates so much with adolescence. Our children are forging their own identities while at the same time struggling to fit in. I also think it’s fascinating that Brene Brown’s research found that the greatest barrier to belonging is fitting in. This is because people tend to change who they are in order to fit in, becoming a less authentic version of themselves. For adolescence, it is particularly challenging because they are still trying to figure out their authentic selves. I also really connected with the idea that the people, who have the deepest sense of belonging, are also the ones who are most willing to go it alone if need be. It turns out that a person with integrity, who will risk social isolation, is the most likely to have strong social support. This is a super important lesson for us to teach our children, especially at this time in their lives. Middle schoolers are old enough to understand the difference between fitting in and belonging, and are beginning to identify where they feel they belong. It is our responsibility to remind them the importance of finding a place they feel they belong and also to constantly reinforce the idea that they should never compromise who they are in order to make friends. Fitting in is not all that it is cut out to be. Another quick video worth watching on topics I wrote about last week is this one on the Power of Relationships in School. It’s only 3-½ minutes but it does a good job of showing scientifically why students learn better when they have positive relationships with their teachers and peers. As a reminder, the San Carlos School District Strategic Plan survey was delivered to your email inbox from the following email address: support+sancarlos@panoramaed.com today, Monday, February 11, 2019. We are eager to hear your feedback. If you have not had a chance to complete the survey, please take a moment to do so by the end of the day on Wednesday, February 27. Please note that each parent/guardian received a survey link for each of his/her children. Please fill out one survey per parent/guardian, per child. If you would like more details on the content of the survey, please continue to read below. Thank you. Please click this link to get information about Carlmont’s Incoming 9th Grade Information Night. The deadline for ordering is Friday, Feb 15. Thursday, February 27th is the final deadline to enroll your child on the 8th grade Washington, DC and NYC trip from June 17, 2019 to June 21, 2019. You won't want your student to miss this once in a lifetime opportunity. Learn more about the trip and sign up at www.efexploreamerica.com/2101599md. The front office has been inundated with orders from Doordash lately. It has become too much for us to manage so we ask that students not order from Doordash for lunch. It is okay to drop off a lunch or to order from our hot-lunch program but please do not rely on delivery companies to supply lunch for your child. Auditions for the annual CMS Talent Show are here. Students can sign up for a time slot in the front office beginning today, Monday, February 11th. Auditions for talent and hosting will be held the week of February 25th - March 1st at lunch. The Talent Show will be held March 21st during Second Step. 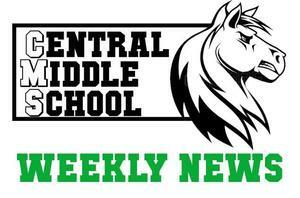 Show your school pride and wear your CMS gear and/or the color Green. We are proud to be Mustangs. We are Safe, Supportive, Respectful and Responsible. 2/12 is tutu day-wear your favorite tutu (we’ll have some to borrow too) and/or rainbow colors. CMS supports all students exactly as they are. Tie Dye Day-wear your favorite tie dye clothing. CMS supports peace, love and kindness for all. Valentine’s Day-wear red and/or pink. Love wins! Love of friends, love of family, love of animals, love for our planet. Spread love to everyone and everything. National No One Eats Alone Day- wear purple to show your support to end social isolation. The Beyond Differences Club will be sponsoring music and lunch time activities. CMS is inclusive. The San Mateo County Libraries is offering a super cool opportunity for middle school students to showcase their creativity. Our 11th annual Teen Film Festival is in March, and we're inviting students to either make a short film of their own to submit or to just come to the Festival to watch a bunch of teen-created movies. The 5th-8th grade group's Festival is Saturday, March 23. It'll be at the Millbrae Library from 1:30-4PM. If any kids want to enter, their films are due Saturday, March 2 -- details on entering are available at the school library or San Carlos Library. February 12th, 7-8PM at Heather Elementary School. See Superintendent Harmeier’s video invitation here. If you are not able to attend but would like to watch, we will be using Facebook Live for live streaming of the presentation. Be sure to follow San Carlos School District on Facebook to watch it live. We will share the complete calendar with families after it is adopted by the Board. Please contact the District Office if you have any questions. Please join us for an interactive Parent Information event with Health Connected to find out more about the sexual health programs taught in school in 7th grade. The City of San Carlos is starting the process of developing a Bicycle & Pedestrian Master Plan and they need our input, especially because our SCSD students will be impacted by this plan. Please check out this website for more information www.cityofsancarlos.org/bikepedmasterplan, and attend the open house on February 21, 2019 from 6-8pm at the San Carlos Library to provide your input. Share this information with neighbors and friends who may also be interested. Teacher Outing and Summer Camp Auction Closes THIS Tuesday February 12th at 10pm! Don’t miss out on your chance at laser tag, bowling, Principal for a Day, Librarian for a Day, Summer Camps, Anthem singing, Giants tickets, and more! Buy Your Lucky on Live Tickets! Buy your Lucky On Live tickets! Have family and friends who would like a chance to win one of our spectacular Gala auction items? Only 275 tickets will be sold! If you would like to purchase raffle tickets send an email to luckyonlive@scefkids.org. Tickets are $100 each or 6 for $500.